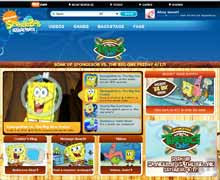 Media Planet: Spongebob.com/bigone - Spongebob vs The Big One Online Game. Spongebob.com/bigone - Spongebob vs The Big One Online Game. Spongebob.com/bigone - Spongebob vs The Big One Online Game. Nickelodeon celebrates this year the 10th birthday anniversary creation of their famous SpongeBob SquarePants with some great moves: like this new online game website, Spongebob.com/bigone and spongebob.com, where you can sneak a peak at Spongebob vs The Big One funny new episode and also play fun online games! Great news! A new documentary on the famous animated character - SpongeBob, will air this fall on MTV Channel thus new episodes and a special a half hour of SpongeBob vs. The Big One... Also this year SpongeBob will make partnership with Nick The Big Green Help in a great campaign, on environmental protection of water and the oceans, in partnership with Natural Resources Defense Council and the National Wildlife relations. Spongebob.com/bigone I love this online game just great! i tried to enter a code, but were do you enter it? Just go to Spongebob.com/bigone and enter it! It works fine!